Meet boxer Joe Bonaparte: smart kid, tough, determined, wickedly fast hands. And one more thing, self-destructive. You could say Joe, the anti-hero of Clifford Odets’ classic 1937 play “Golden Boy,” launches his own career, hurtles himself into a high orbit. Except that he doesn’t stop with mere orbit. In his anger-propelled ascent, Joe just keeps going and going, up, up and out. The beauty, if that’s the word, of Nate Santana’s portrayal of this increasingly ugly character, in Griffin Theatre’s punchy production, is that you can’t take your eyes off him even as he pummels his life into a bruised mess, until he’s unrecognizable as the appealing, ambitious upstart who first bursts into our line of sight. This is full-length theater in the old sense of the world: 15 rounds, so to speak, and hard-fought to the end. With not one but two bathroom breaks, and you don’t even notice the time going by. “Golden Boy” is a mesmerizing study in the way insatiable need can push a starving, blindered soul past bounty’s table to rack and ruin. And Griffin’s take on it, taut and unrelenting in the hands of director Jonathan Berry and a splendid ensemble of actors, is a pleasure worth savoring. 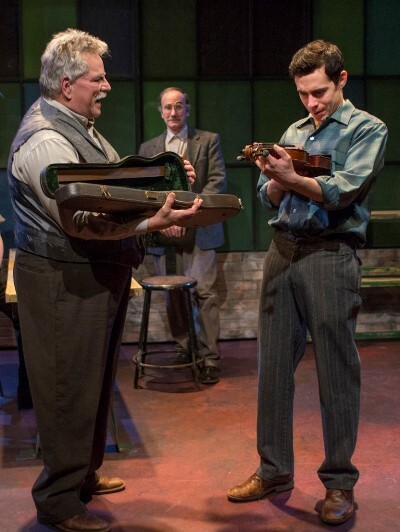 Santana goes straight to the troubled, rebellious, desperate heart of Joe Bonaparte, a gifted violinist and son of an Italian immigrant father, who harbors a secret wish to break out of his nerdy mold and break away from his father’s constraining expectations. Turns out Joe isn’t just a terrific fiddle player, he’s also a skilled boxer – a real diamond in the rough who suddenly gets his chance, gets a manager and a good trainer, and goes straight to the top. Problem is, Joe is merely busting out, he’s lashing out, and it seems the greater his success, the wider the hole in his heart. He wants it all, perhaps symbolized first and last by fast cars; but Joe’s notion of all is endlessly expanding. 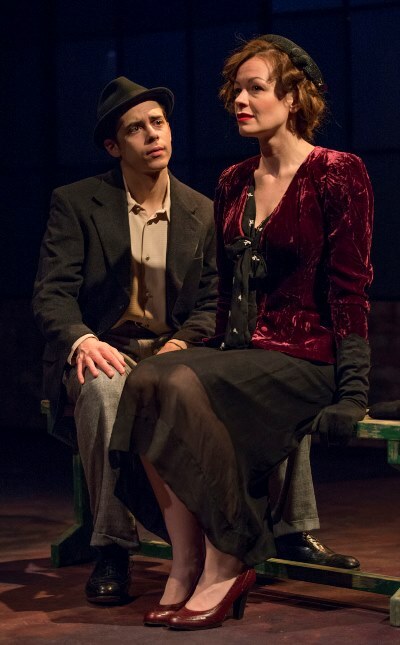 His sad vulnerability finds its perfect match in his manager’s girl Lorna, whose bottomed-out self-esteem and confused affections Nina O’Keefe embodies with soft-centered credibility. Lorna can’t stop the cylcle of her kiss-and-scratch relationship with the kid’s perpetually desperate manager Moody, played by Mark Pracht with the dubious certainty of a gambler waiting for his luck to turn. Inevitably, Joe’s prowess draws in a shady, threatening figure called Eddie, who is also Italian and like a good paesano takes the lad under his protective wing. David Prete lends Eddie just the right slick exterior while telegraphing to all those around the young fighter a danger the single-minded Joe refuses to see. As Eddie’s influence – and Joe’s success in the ring – grows, the boxer’s connection to his proud and devoted father diminishes. Norm Woodel offers an affecting performance as the senior Bonaparte, who wants only happiness for his son but grieves to see his good, musically gifted boy being swallowed up by the sordid fight game – and to watch those blessed hands getting crushed and remade into blunt clubs. 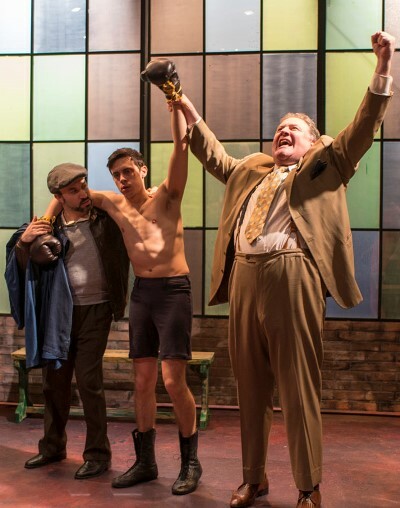 “Golden Boy” bears out the axiom that there are no small roles in theater. This production is spiced with fine supporting work: Jason Lindner as Joe’s trainer Tokio, who both conditions and coddles this temperamental contender on whom everyone’s hopes and a lot of cash are riding. John Connolly gets right to the annoying essence of Roxy, the loud-mouthed backer who never bothers with subtlety when there’s a ham-handed option. Laura Lapidus and Morgan Maher, as Joe’s sister and her ever-angling husband, provide brusque comedy while adding an earthy texture to the Bonaparte household. As their foil, Jerry Bloom is quietly charming as the family’s philosophical friend Carp, who has a Schopenhauer quote for every circumstance. Set designer Dan Stratton uses movable parts to make efficient use of Theatre Wit’s modest playing area, with figurative scene changes made by the actors. Rebecca Barrett’s creative lighting plays its own emotionally charged role, and Mieka van der Ploeg’s expressive costumes top out with the fine suits that announce Joe’s arrival in ominous Eddie’s high-end world of sleaze.